uuid : 3d30f726-6d06-4e97-88cd-9e78da254550 templates_id: 119504 templates_uuid: "bc2faa83-3a49-457d-878d-9f4e58f3aacf" title: "Letter Before Action - Letter Before Claim - Letter Before Action Template" display_name: "Letter before action" meta_keywords: "Final demand letter and Letter before claim" description: "
A letter before action is the last letter you should send before commencing legal action to recover a debt. A final demand letter formally reminds and requests your client or customer one last time to make payment before you take legal action. 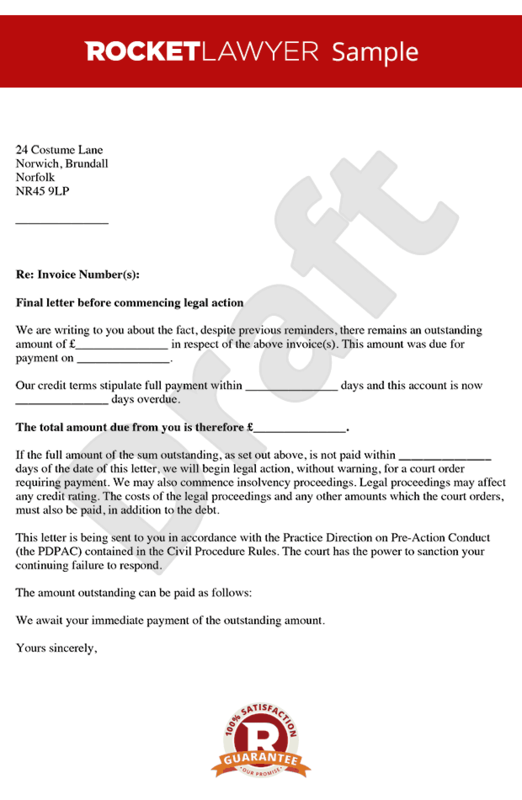 This letter before claim details all the necessary information including the date the debt was owed, any interest that is to be paid, and how long the debtor has to pay before legal proceedings will take place. What is a letter before an action? A letter before action is a final demand letter that reminds and requests your client or customer one last time to make payment before you take a legal action. It sets out the amount that is owed, the date the debt owed should have been paid, whether interest is payable and the deadline for paying off the debt in order to avoid legal proceedings. Why do I need a letter before an action? You need a letter before action when you want to recover your debt and when you intend to give the debtor a last chance for payment before commencing legal proceedings for collection and enforcement of the debt. This letter will ensure that your customer or client understands that this is the last chance to pay and what will be the consequences of not complying with it. It is also important to show the court (in the event of legal action) that you have made all possible effort to contact the debtor and resolve the issue outside of court. Can you use this letter if there was no contract between the debtor and yourself? You can use this letter if there is no contract between the debtor and yourself. However, if there was no contract, and wish to charge interest you can only claim statutory interest. This only applies to business to business transactions. Currently, the statutory interest is 8% plus the Bank of England base rate for business to business transactions. You cannot claim statutory interest if your customer is consumer and not acting in the course of business. In such scenarios, you can only claim interest if the contract sets an interest rate. What are the next steps if you receive no response to this letter before action? If you receive no response to this letter within 14 days you may commence legal proceedings.
" created_timestamp: "2018-10-08 04:36:28.0" modified_timestamp: "2018-10-08 04:36:28.0" active: true created_by: 157 modified_by: 157 dcm_id: 255 url_slug: "Letter-before-action" meta_description: "Create a letter before action with step-by-step guidance from Rocket Lawyer. Make sure you do things right when sending a final demand letter to request payment of an overdue debt. Try this letter before claim for free." time_to_complete: "20 minutes" role1: "Creditor" role2: "Debtor"
More than just a Letter before action template, our step-by-step interview and guidance makes it easy to create your document. Easily create online, download, print and sign your free Letter before action in minutes. This document is also sometimes called: Final demand letter and Letter before claim.